Dr Muhammed Rafeeque: Dear doctor, please go through the life history of Hahnemann, and his deep knowledge in botany, chemistry and various other subjects. Apart from Homeopathy, Hahnemann had contributed many things to chemistry. He had even made the preparation of soluble mercury, and some of his works on Chemistry is used even today. Unfortunately, present day scientists intentionally forget his name. His knowledge in Botany is worth mentioning. He had incorporated all his knowledge in his writings, and hence the homeopathy is based up on pure experimentation, scientific interpretation and reasoning. Science is not only the use of some machines and sophisticated labs. Science started since from the era when the man started logical thinking. True that at the time of Hahnemann, the resources were relatively limited, still he did the scientific research and published the same. The points told by Hahnemann are even used by experts of various systems, not only medicine. Even the ideas proposed by Hahnemaan are applicable in the modern era. His concept on the disease and its management are well adapted by even many modern medical text books, though they have not mentioned his name. If we read the introductory part of Hutchison’s Clinical methods, we can see that the concepts of Homeopathy are well accepted even today; including the holistic concept. And Homeopathy had many experts even after the demise of Hahnemann, who continued the legacy he left behind. Hence, there are works in terms of homeopathic research and philosophy, written by experts who had more exposure to the modern scientific concepts and technology. Please remember, most of the pioneers of Homeopathy were medical doctors. Dr Constantine Hering is the best example. He was appointed to write a book against Homeopathy. When studied Homeopathy without any kind of bias, he understood the truth behind this system and started practicing Homeopathy and contributed maximum for the system. Similarly, Dr J T Kent, Dr H A Roberts, Dr Stuart Clause, and many others. If you had gone through their original works, you would not have written the above statement. They made the concepts of Hahnemann more clearly and in terms of modern science. Dr Muhammed Rafeeque: You have never gone through the hundreds of studies done on homeopathy. Whatever you have written is taken from the WebPages posted by the critics. Please come out of those WebPages, and observe and think beyond. Otherwise we will be like a frog in the unused well. You must do your own research and use the resources. Most of those “scientific” studies are done by vested interests funded by the pharma-lobby. The best example I can give you - James Randi, the critic of Homeopathy. He had challenged Homeopaths to do a scientific study. George Vithoulkas from Greece had accepted the challenge and started the treatment protocol. When the study was going in favor of Homeopathy, James Randi escaped from the scene, and did not give the prize money. Vithoulkas is still ready to show the result, but Randi is hiding behind the curtain. This is only one example, there are many such examples where homeopaths were denied to share their results; even our articles and easily rejected. This is not scientific attitude, but only a one sided sensational journalism. And those who copy-paste the same becomes the proponents of sensational journalism. Dr Muhammed Rafeeque: I am sorry to read this. In spite of being a doctor, you do not know the value of our mother land. Since prehistoric era, Indians lead the science and philosophy. The concepts of Indians were adapted by the western researchers. Do you know how scientific the Indians were, that too with limited resources? So, you must withdraw the statement. Now coming to the topic, have you ever gone through the world statistics in terms of Homeopathy and its turnover? Do you know the status of Homeopathy in countries like France? Do you know the percentage of MODERN MEDICAL DOCTORS in western countries who practice Homeopathy? Have you ever gone through the WHO statistics about homeopathy? Do you know that AGRO-HOMEOPATHY is more popular now? Do you know there are Veterinary Homeopaths in the western countries, who work as a separate profession? (Here in India also they often give Homeopathy, but there is no separate profession. But now there is a Homeopathic course conducted for them at the Agricultural University). Do you have any veterinary doctors as friends? Ask them, they will tell you the result with homeopathic drugs like Conium 200, Bryonia200, Phytolacca200, Pulsatilla 200 etc. in the treatment of mastitis. Usually they give these drugs when the antibiotics do not give any result. Near to my clinic, there is a government veterinary hospital. As per the information given by the doctors in that hospital, most of their colleagues give homeopathy for mastitis. It will provide milk without antibiotics! Recently, Indian honey is rejected by some foreign countries due to high antibiotic content. In Morocco I came across Homeopaths using homeopathic medicines for the diseases of honeybees, and the result is wonderful – Honey without antibiotics! I can give the details if you are really interested. What I understand is, you might have read some news reports on the stoppage of funding for some institutions in UK, or you might have gone through the Australian report published as government report, which was not a government report in fact. It was a biased study published by the vested groups. A medical system existing in this world itself proves its efficacy. Do you know the total number of medical systems in this world till today? Not easy to count! Out of which many are not existing or not even known. Only those systems were found effective are surviving, other systems were discarded by the people. Do you think that people are fools to spend money and time for homeopathy? It is because of the result they get. When they don’t feel better by modern medicine, they try homeopathy, and once we cure, it becomes “placebo effect” for you people. Dr Muhammed Rafeeque: I take this statement positively. At least you agreed that Homeopathy is leading, though you included homeopathy under the banner of pseudoscience. Dr Muhammed Rafeeque: You may kindly read the Homeopathic Revelation by Dana Ullman. You will come to know the long list of scientists including many Nobel Laureates supporting homeopathy. Do you think they are all fools? I hope you know Sir. William Osler, the father of modern medicine. He said about Hahnemann, ‘No individual has done more good to the medical profession than Samuel Hahnemann’. Do you think that Osler had no scientific thoughts? Dr Muhammed Rafeeque: I think you consider development is something like use of some sophisticated machines and posh buildings. Yes, in that contest, medicine was not developed at that time. Now the medicine is well developed enough to kill thousands of people by drug testing, and by side effects of developed medicines and unscientific combinations. Morbidity rate is day by day increasing. Even the young generation is affected by the side effects of developed medicine. The repeated suppression of diseases is responsible for most of the diseases. And the scientific medical people are washing their hands and say that morbidity is due to life style diseases. Almost 60% of so-called life style diseases are due to the side effects of so called scientific medicine. Scientific people are using the drugs banned in other countries, and you never use your scientific brain for this. Science should benefit the people. The great Hippocrates said, “do no harm”, unfortunately the present day medicine is doing only harm. Visiting a modern medical hospital is almost like visiting a ‘blade mafia’ head office. Now the scientific doctors do not speak with the patients, but the agents of finance companies speak and bargain before starting treatment. Even the medical reports are not given to the patients for fear of losing patients to homeopaths and others. Dr Muhammed Rafeeque: I think you are under a wrong notion that old things are unscientific and only the current things are scientific. Please remember, after hundred years, we will be called by our coming generations as aborigines! Dear doctor, try to respect the great medical people like Charaka, Susrutha, Hippocrates, Hahnemann, and many more. They had less resources, but more insights than us. Can any modern brain can think more than Aristotle and Socrates? Can we live without the gadgets and instruments we are familiar with? Can we diagnose the disease without an MRI or CT? How many doctors examine the patients now a days? Clinical examination is now outdated due to those scientific machines. You must also correct your statement regarding 150 years, because medicine actually lost its principles and vitality during the last 150 years, because now treatment is only a business, and doctors are agents of that mafia. Now what is told by the medical representative is the ultimate for doctors. I have worked under many modern medical doctors including specialists. I have seen many of them prescribing the scientific medicine when the MR says, “this is good medicine, please continue support sir”. If this is development, then sorry, I am not happy with the development of medicine. Dr Muhammed Rafeeque: It is true that Allopathy became Modern medicine now, but it is almost like an old wine in a new bottle. Even though some of those old methods are not used now, the approach to the sick patient is same, or even worse. Modern medicine is almost like a ship moving without any aim. Its only motto is to suppress the disease and make it more deep seated. I feel that the old allopathy was relatively better than the new modern medicine. Now, not only the patients, even the coming generations are suffered by the modern medical drugs. It kills more people than the deaths by weapons. Even though mortality is less, morbidity is rising day by day. Hahnemann was not a person who jumps into a conclusion blindly. You have not read his history, but you have gone only through the posts about him written by the critics. Do you know how many years he took to publish each research works he did? He did so after many years work and observation, and then published it. So, his change of profession was not like today’s young generation changing job for more money. It was a wise decision, and that decision is serving the humanity in the form of Homeopathy now. Dr Muhammed Rafeeque: Even though microscope was not there at the time of Hahnemann, he had mentioned those disease causing agents which comes after the fundamental cause- the miasms. Hahnemann never ignored the clinical examination of the patient and disease diagnosis. If you visit the home of Hahenmann in Germany, even now you can see the old stethoscope used by him. He used to do clinical examination also. This is the wrong notion you had when you read only one or two aphorisms of the Organon. Quoting can often result in wrong understanding of the subject when we ignore on which context it was used. The aphorisms of the Organon are interlinked, though they are numbered as aphorisms (§). We often get the clarity by reading the further aphorisms. True that he had discouraged the use of nosological diagnosis as an exclusive tool for remedial diagnosis. In fact Hahnemann supported disease diagnosis to rule out the common symptoms of the disease and consider the peculiar symptoms for the final remedy selection. The only thing is he never supported the concept of prescribing only by looking at one pathology in the organ, he emphasized the holistic concept. Now the modern medicine also agrees with the holistic concept of homeopathy (first denying what other say, and later adapting the same is always the trend of allopaths/modern medical doctors). Hahnemann never supported the specific medicines and combinations. Today, the medicine is the victim of unscientific combinations. Drug interaction is the main villain even today, also drug resistance. It is all because of following the Galen’s old concept of mixing many chemical together and too much overdosing. In that contest, modern medicine is only an ancient medicine of Galen marketed in new colorful bottles. The word ‘modern’ does not suit its present methodology of drug administration and marketing. We treat every patient as an individual; we do not give over-importance to diagnosis. According to the International classification of diseases, many diseases are classified under “undiagnosed group”. Nowadays, even for patients coming with Myofascial trigger points, MRI scan is done. Inspection, palpation, percussion and auscultation is now outdated, because we have other “best methods” to diagnose. Even for diagnosed cases, the treatment is only symptomatic. Psychosomatic diseases are considered now, but we know that since our beginning. I have seen many modern medical doctors criticizing Yoga, but now they also follow the same. If a person feels better (mentally, physically, emotionally, and clinically) by one method of treatment, there is nothing wrong in following that method. I had attended a nutrition class lead by some modern medical experts. They said frankly, “We have no medicine for many diseases; still we give some vitamins only to satisfy the patients, but these patients goe for other modes of treatment for better result”. After all, personal experience is the best evidence. Now the general practitioners are getting endangered, because doing general practice is becoming a last choice. The ONLY solution to eradicate all these drawbacks is - give more importance to the teachings of great physicians than the words of medical reps and pharmaceutical companies! • Medicines selected on the basis of symptoms give only short results. • There is some hidden cause behind recurrence. • The remedy should cover the miasmatic totality. • Miasms gets activated by suppressions and repeated symptomatic treatment. Dr Muhammed Rafeeque: I think I have already covered some of the points you have mentioned. Hahnemann had used different terminologies available in those days. In his writing, he has even used the terms that are synonyms of the terms used in medicine today. Even without the use of machines, that great man rendered service to the human beings. So in fact you must appreciate Hahnemann for his knowledge and dedication. Even many experts had analyzed Hahnemann with critical views, but later became the ardent followers. The history will always repeat. Even in India, I can show many modern medical doctors who practice homeopathy successfully. Dr Sircar of Kolkata was a strong critic of Homeopathy, but later he started the first homeopathic medical college in Kolkata. There are many such hints in the history. Also you can read the original works rather than going through the blind web pages. Dr Muhammed Rafeeque: Yes, the miasms are immaterial causes, which can be influenced only by similar dynamic stimuli. That is why he made the medicines dynamic. Even in our day to day practice we experience the action of our medicine; also the patients experience the same that is why many of them come to us leaving the allopathic medicines. Now tell me, have you heard about Hormesis? Please go through that. It is a latest method in which a substance becomes more active in its minute dose than its crude form. You can also read the book by Stuart Clause to know about the action of the minute doses. Human body is affected by overdosing of crude drug substances since decades. The modern medical experts in the west are already following the minimum dose concept, but in countries like India, tons of medicines are bombarded on the poor patients. Homeopathic preparation of modern medical crude drugs can be used to nullify the side effects of those drugs. The whole world is trying to adapt good things from others; unfortunately, a few modern medical doctors (not all of them) are interested in blind criticism without knowing the fact. Now even NASA is trying the effect of Homeopathic medicines on the space. Dr Banergea from PBHRF, Kolkata was already invited by NASA for the application of Homeopathic medicines in the space. Dr Muhammed Rafeeque: It is potentisation, not potentiation as you mentioned. Also succession in not grinding, and trituration is not shaking as you said (or the one who posted in the source page) – it is the reverse. Yes, it awakens the curative power of the medicine. It is not a process done haphazardly as you mentioned. It is a mathematical and mechanical process of preparation of medicine with cent percent accuracy. Now we have many sophisticated machines for the same to nullify human error. The preparation is as per the guidelines by the Pharmacopia. If you try homeopathy for a patient after wise selection of the medicine, you can really experience the wonderful result of our medicines. You can also do the RCT, but the medicine must be selected on the individual features of the patient. It should not be like giving Paracetamol to all fever cases. Dr Muhammed Rafeeque: Sorry, all these methodologies you have mentioned are wrong. We use dispensing alcohol for the drug manufacture, not water. A specific quantity of water is used for making mother tinctures and mother solutions only. All these mistakes you made as a result of copy-paste from those critical posts by the skeptics. You may kindly read some authentic Homeopathic pharmacy book for clarity, and then make critical statements. Otherwise, your wrong write-ups can only invite uncivil answers from the readers. In Homeopathy, medicines are prepared from different sources like plants, minerals, animals, toxic substances, drugs, healthy secretions like hormones, venom, etc. The method used for the preparation of water soluble substances are succussion and for insoluble substances, we use trituration. For succession, dispensing alcohol (ethanol) is used as a medium, and for trituration, we use lactose. Nowadays advanced machines are used for the process. Dr Muhammed Rafeeque: True that there is slight difference between different pharmacopeias, but not in the ratios as you mentioned. There are different scales of medicinal preparation, which is not a drawback, but an asset for us. When C potencies do not work in one case, we have X potencies, then finally we can make use of LM potencies. These are the different options we have; just like different kind of preparations you have in modern medicine (not those different brand names of same medicine you give to fool the patients). The basic medicine prepared from the crude drug substance is called mother tincture, from which we prepare the higher potencies as per certain scales like decimal, centesimal , 50 Millesimal Scale. When the potencies increase, the quantity of original drug substance decreases, but the medicinal value is increased. The same drug is available in different potencies. For example: Belladonna. It is available in Mother tincture, 3X, 6X, 12X, 3c, 6c, 12c, 30c, 200c, 1M, 10M, 50M, CM, 0/1, 0/2, 0/3 etc. Dr Muhammed Rafeeque: Even we homeopaths know since its origin that the higher potencies do not have the molecules of the original substance. Do you know nano technology has shown positive findings when homeopathic potencies were tested? You can read the book by Dr K S Rajendran, and also the book by Alexandra Dilinick. There are also many studies conducted by Dr Jayesh Bellare, Mumbai IIT, and Dr Khuda Baksh, kolkata. Many of them are not Homeopaths for your kind information, they are scientists. If possible you can also contact Nobel Laureate Luc Montagnier to know more. Dr Muhammed Rafeeque: The word ‘similia’ does not make any sense at all. The basic principle of Homeopathy is similia similibus currentur. If you want to make criticism, first you must read the available literature. One of the great physicians of Kerala, Dr M S Vallyathan (the man behind chithra heart valve) has written two books – The legacy of Charaka and The Legacy of Susrutha. Please read those works and learn the dept of knowledge our ancient physicians had. They were not living in the 150 years (the scientific medical era as you mentioned previously). When I was at National Academy of Homeopathy India, Nagpur (Institution run by doctors having post graduation in modern medicine) I personally did homeopathic drug proving of Spigelia (without knowing the name of medicine) and had experienced the left sided headache of spigelia. The medicine produce the similar symptoms in the sensitive individuals, others need a few more repetition of the same. I also feel sorry to read one more wrong statement, “..Hahnemann had eaten the leaves of Cinchona and developed allergy…”. From where you got this wrong information? Can you give the source? It was not cinchona leaves, but 4 drams of the extract from the cinchona bark. It is known as Cinchona bark experiment of Hahnemann. And it was not allergy as you mentioned. The same experiment was repeated by many, including Dr Constantine Hering, who actually wanted to attack homeopathy. But all of them experienced the symptoms similar to malaria (not malaria). Dr Muhammed Rafeeque: Anecdotal evidence has its own value. Do you mean to say that our individual experience has no value? We doctors (including modern medical doctors) get patients mainly as a result of anecdotal evidence. Do you think that patients are coming to you after reading the RCT reports published by you? Homeopathy never failed in all RCTs. You must go through the online data available in this regard. The Central council of Homeopathy, New Delhi also published many works, also many individual groups all over the world. In some RCTs it could not be proved, but even they could not disprove homeopathy. Many genuine critics of homeopathy say that it works but how it works is the matter. The absence of evidence is not an evidence of absence. 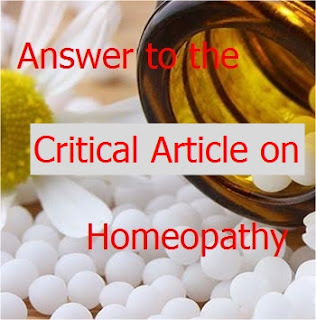 Even now, the homeopathic community is ready to accept any challenges and to face RCTs, but on one condition that everything must be without bias and the true reports must be published. Obviously we do not expect similar foul plays as done by James Randi and team. There is also a difference between the drug selection in homeopathy with your system. You give the same medicine to all of them and do the test. Whereas, in homeopathy, the medicine has to be selected as per the individual features of the patient. So, RCT must be done giving due consideration to the Homeopathic remedial diagnosis criteria. Dr Muhammed Rafeeque: It is true that many diseases (mainly indispositions and some acutes) are self limiting. We all, including Modern medical doctors make use of this. It is a pity that only homeopaths are cited in this matter. There are placebos in all medical systems, you people use vitamins or colorful tonics, and we use non-medicated pills or tabs. But tell me, many cases do not improve even after several prescriptions by modern medical doctors, but when we give our medicines, it works. We have thousands of such examples. And once we cure, it is entitled as placebo cure by you. I can’t agree that 90% fevers in children are self limiting! If at all you feel so, then why you prescribe antibiotics to them in spite of knowing it is self limiting? Why creating trouble to those 90 % of innocent children? It is nothing but medical negligence (act of commission). If the homeopathic cures are placebo effect, then how we get results in newborn babies, unconscious patients, animals, plants, etc? Do you think that it is faith that cures plant diseases? Have you ever gone through the cases treated by homeopaths? Never! We Homeopaths manage all types of diseases including life threatening chronic diseases, not just cold and coryza as you think. You must also go through the successful cases in homeopathy, both in treatment as well as prevention. There are many successful homeopathic practitioners, both in private and government sector, and also there are Homeopathic colleges, charitable centers, and treatment centers by organizations and groups, curing hundreds of cases coming from the hands of modern medicine. Many epidemics were successfully prevented in different parts of the world. India has well accepted Homeopathy since many years. The successful management of many epidemics like cholera and JE made it popular. Many great Indians like Mahatma Gandhi, Rabindranath Tagore and many more were the proponents of Homeopathy. The successful prevention of Japanese Encephalitis in AP state was a much discussed topic, also the prevention of Leptospirosis in Brazil. Now there is a homeopathic hospital in Mogalapilly, Telangana, managing snake bite cases using only Homeopathic medicines. Like other states in India, Kerala also has hundreds of success stories, which finally got approved as Rapid Action Epidemic Control Cell in Homeopathy (RAECH) by the Kerala government. The recent success of Infertility cases by the Seethalayam project of Homeopathy department, also the success of Cancer Hospital in Wandoor and Genetic disorders project in Vijayapuram, Kottayam shows the efficacy of Homeopathy. These cases are not anecdotal evidences as you said. There are cured cases with documented evidences, which you can verify in case you are really interested. Dr Muhammed Rafeeque: I personally have cured hundred of corns and warts (warts, corns and plantar warts/callus are not same entity as you mentioned. Please read some dermatology colored atlas or visit google images) I am ready to show my cured cases. You are always welcome. Homeopathy is the best alternative to that painful corn surgery, which will make a deep burrow on the sole, and the corns recur again after a few months. I have cured many such patients. Dr Muhammed Rafeeque: Homeopathy is equally effective in acute emergencies. Of course, some cases need emergency life care support; hence we take support from modern medical doctors. Whatever modern medicine is having now are only the joint efforts of many experts, not only modern medical doctors. Even there are cases that do not respond to modern medicine, but responding the same with homeopathy. There are such institutions in many countries. In India, especially in places like Mumbai, Homeopaths on many occasions are invited to modern medical centers to try homeopathy. We also get requests from our modern medical friends to try homeopathy for their family members. No system in this world is complete. All systems are now working under one roof for the benefit of the sick people. One day we all will leave this world in spite of having scientific developments in medicine. No one can prevent death. So, for the sake of our suffering people, let’s forget the personal issues and clashes, and work together. The choice is always left to you dear doctor. Nice sir,The Characteristics and qualities of medicines that used in therapeutics have prime importance. What are the reference about homeopathic drug proving done in black (Negros and Asians) as in white European constitution?